Search for Schools & Free Scholarships. The Gulf of Mexico is a major body of water bordered and nearly landlocked by North America. The gulf's eastern, northern, and northwestern shores lie within the United States of America. The gulf is bordered on the southwestern and southern shores with Mexico. The Gulf of Mexico is well known for its calm sea conditions and excellent year round deepsea fishing. 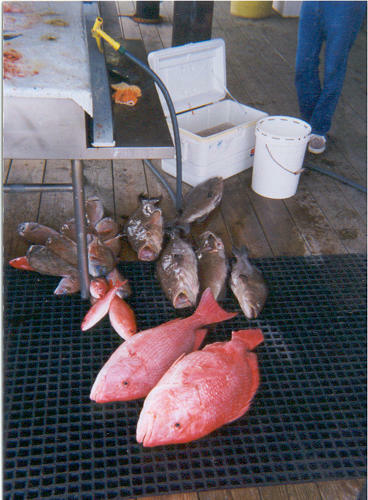 Deep sea fishing on the Gulf of Mexico for grouper and snapper is good most any time of the year. Other offshore fish such as kingfish, cobia, tuna, amberjack, Spanish mackerel, dolphin, shark, barracuda, tarpon, permit, mahi and giant red fish are all caught as they seasonally migrate through the deepsea waters of the Gulf of Mexico. The total area of the Gulf of Mexico is approximately 615,000 square miles. Coastal cities along the Gulf of Mexico include Tampa, St. Petersburg, Pensacola, Mobile, New Orleans, Beaumont, and Houston in the United States,Veracruz and Mérida in Mexico, and Havana in Cuba. Shallow-water grouper quota reduced from 9.35 mp gutted weight to 8.80 mp gutted wt. Commercial shallow-water grouper fishery closes when either the shallow-water grouper or red grouper quota is reached, whichever comes first. Deep-water grouper quota reduced from 1.35 mp gutted wt to 1.02 mp gutted wt. Enjoy the fishing trip of a lifetime in the Gulf of Mexico.! At a depth of more than 12,000 feet, Sigsbee Deep is the deepest part of the Golf of Mexico . It is more than 300 miles long and is sometimes called the Grand Canyon under the sea. Its closest point to the Texas coast is 200 miles southeast of Brownsville. The shortest distance across the Gulf of Mexico is about 500 miles between the Mississippi Delta and the tip of the Yucatan Peninsula. The greatest distance across the Gulf of Mexico is approximately 1,000 miles going east to west. The Gulf of Mexico links the ports of five southern U.S states (Florida, Alabama, Mississippi, Louisiana, and Texas) and six Mexican states (Tamaulipas, Vera Cruz, Tabasco, Campeche, Yucatán, and Quintana Roo) with the Atlantic Ocean and Caribbean Sea. The United States and Mexico form the Gulf of Mexico's mainland shore, which extends more than 4,000 miles from the Florida Keys to Cabo Catoche, at the northwestern tip of the Yucatán Peninsula in Mexico. The Flower Garden Banks National Marine Sanctuary contains the northernmost tropical coral reefs in the U.S.
Aransas National Wildlife Refuge in Texas is the wintering ground of most of the world's whooping cranes in the wild. Padre Island National Seashore in Texas is the nation's longest stretch of undeveloped beach. At a depth of more than 12,000 feet, Sigsbee Deep is the deepest part of the Gulf of Mexico . It is more than 300 miles long and is sometimes called the Grand Canyon under the sea. Its closest point to the Texas coast is 200 miles southeast of Brownsville. Enjoy your visit on Anna Maria Island by relaxing on the pristine beaches or tour the island's many historic sites by bicycle. Let our Anna Maria Island Guide help you plan every aspect of your Florida vacation - from lodging & dining to local island history and weather. Anna Maria Island is a seven mile barrier island located in the southern Gulf Coast area of Florida and is renowned for its white sand gulf beaches and gin clear water. Anna Maria is the northernmost of a string of barrier islands that extend in a southerly direction to the Florida Keys.The Island itself is surrounded by the Gulf of Mexico to the west, Tampa Bay to the north and Sarasota Bay and Anna Maria Bay on its eastern shores. Fishing abounds on Anna Maria Island. The island offers three fishing piers: Anna Maria City Pier, Rod & Reel Pier and Bradenton Beach. Anna Maria Island is a famous for its miles of white sandy beaches with stunning sunsets over the Gulf of Mexico. Here visitors can find world class angling, boating, surfing, golf, tennis as well as a rich selection of exotic wildlife. 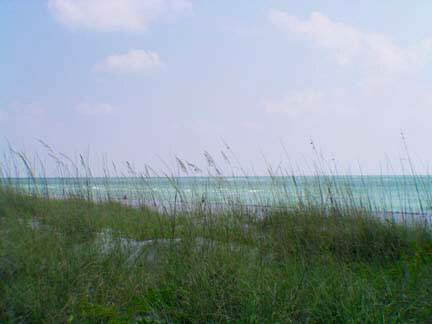 In fact, the entire island of Anna Maria is considered a wildlife sanctuary! Save up to 50% on Premium-quality aquarium fish, corals, clams invertebrates, and live rock. Stay-alive guarantee. Tons of exotic species. The official hurricane season for the Atlantic Basin (the Atlantic Ocean, the Caribbean Sea, and the Gulf of Mexico) is from June 1 to November 30. The peak of the season is from mid-August to late October. Florida Vacation Homes & Condos! Use the equity in your home to buy your dream vacation home, beach house or waterfront condo in paradise!